After much trial and error, I’ve hit on the best way to cast on for the strips in my modular knit Log Cabin Baby Blanket. (Wish I’d looked at yesterday’s comments before all that fiddling and seen Karen’s suggestion). Crocheting onto a knitting needle, like I do when I start off the waste chain for a provisional cast on, works nicely. It produces an even chain type edge, analogous to the strip’s bind off and chain selvage edges. I’ve described crocheting on before, but here’s another swag at it. I’m grabbing the working strand with the crochet hook and am about to pull the just-grabbed strand through the existing stitch (in effect, I’m making a crochet slip stitch). Ignoring the errant strand of Smaller Daughter’s hair in the shot above, what we wind up with is a stitch on the knitting needle. I’ve moved the working strand to the back of the knitting needle again, and am poised to make another. Crocheting on works especially nicely for provisional cast-ons. 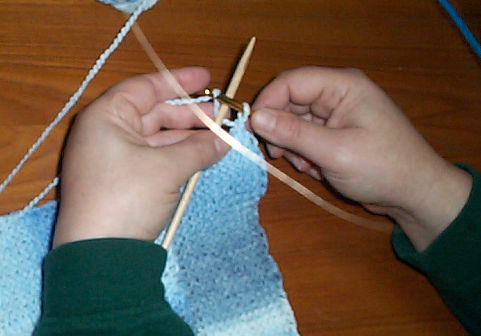 Instead of crocheting a long chain THEN fiddling with the bumps on the back of the chain, trying to pick them up, this method produces the chain edge and mounts the stitches in one step. 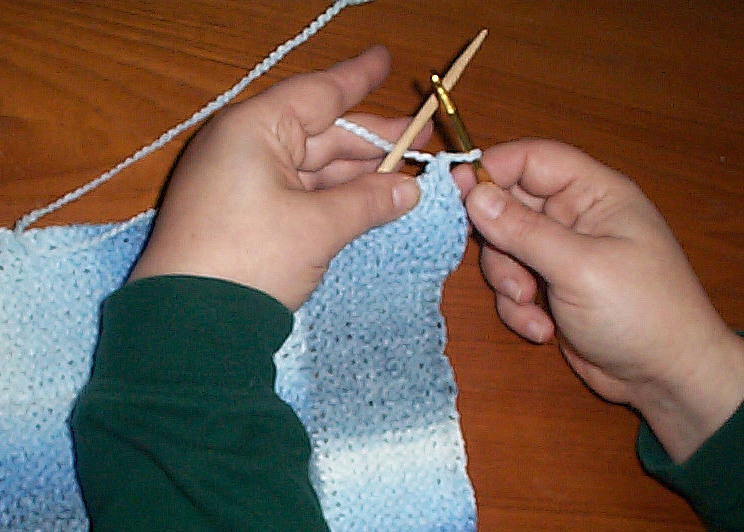 It’s one of the core techniques I teach in my occasional “Crocheting for Knitters” workshop. Finally, here’s the working method. It’s not a pattern because I am not giving yardage estimates, gauge or dimension. These log cabin blocks can be made to any size and assembled like a standard patchwork quilt, or the working logic can be used to make a larger object as a single square. For the record, I’m using Austermann Batika Color, a bulky weight yarn with a native gauge of 4 stitches per inch in stockinette, on 6mm needles. I’m getting roughly 4 stitches per inch and four garter ridges per inch in garter stitch on US #9s (5.25mm). 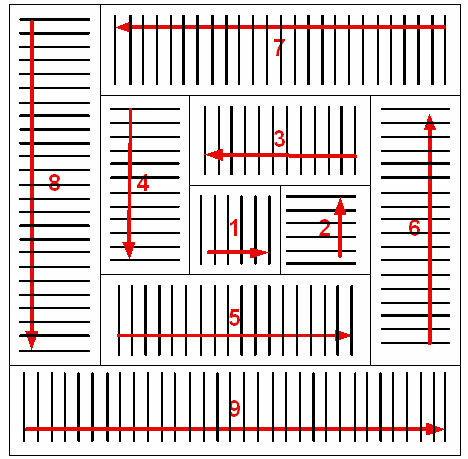 My initial square was about 3×3 inches (roughly 7.6cm), and all my subsequent strips are about 3 inches wide. The best way to join ends of Batkia when starting a new ball is to thread the new strand into a standard tapestry needle and stitch it through the center of the chainette for about 2 inches, like feeding an one eel to another. 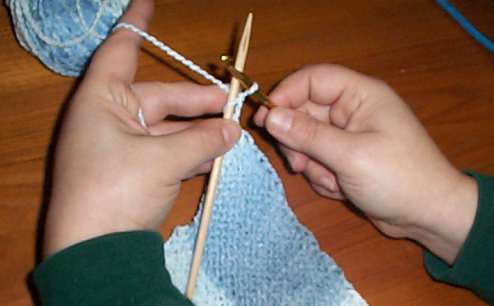 Once the doubled length has been knit, any flapping ends can be trimmed back without fear of raveling. Cast on 12 using crocheting on. Row 1: Slip the first stitch purlwise, knit 10, k1b. Repeat Row 1 until you form a square of garter stitch. In all probability there will be 12 chain selvage edge loops running up both sides of the square. Cast off 11. One stitch should remain. Do not break yarn. Using the last remaining loop, crochet on 12 stitches. Row 1: Slip the first stitch purlwise, knit 10, k1b. Draw a loop through the first available chain selvage stitch on the previous square or strip (it will be the edge to the left of the new strip’s attachment point). Enlarge this loop until it’s big enough to knit with. Turn the work over. Row 2: Pulling the loop tight and making sure you’re knitting with the anchored side rather than the side that runs free back to your ball of yarn, knit 11, k1b. Turn the work over. Row 3: Slip the first stitch purlwise, knit 10, k1b. Repeat Rows 2 and 3 until your new strip runs the whole width of your piece. 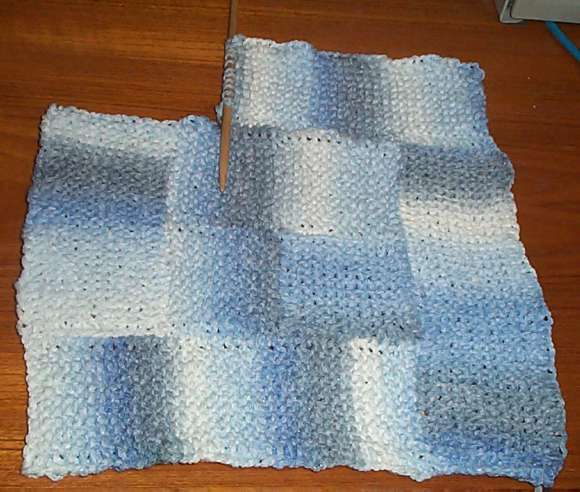 The first time you do this, it will be a square of 12 stitches x 12 garter ridges. The second strip will be a rectangle of 12 stitches x 24 garter ridges and will run across the top of the first two squares. Next row: Cast off 11. One stitch should remain. Do not break yarn. Repeat the strip directions, always adding strips counterclockwise around the perimeter of the piece, with each strip running the full length of the available side.